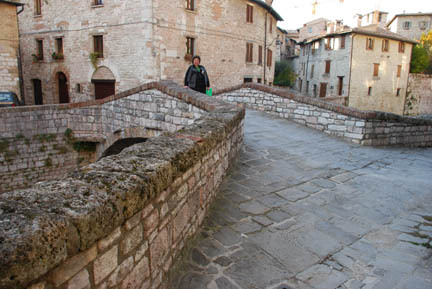 We visited Gubbio in Umbria, a small town that dates from Etruscan times. It climbs a hill and is pedestrian only. We only spent one day here. We are starting to work our way back north towards Amsterdam, we have plane tickets home on the 15th of November from there and we have three weeks to get there. 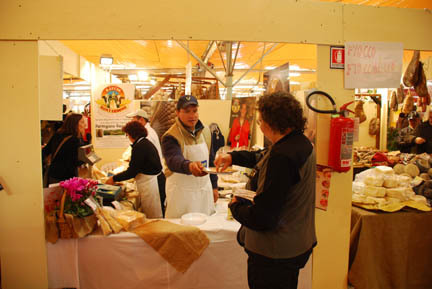 It is the height of Truffle season and Gubbio was having a food fair with truffles, cheese, olives, ham, jam, wild boar sausage, wine, candy, all locally made. We had a good time there, they were all giving out samples. There were local arts, crafts and artists. And even a forestry display. 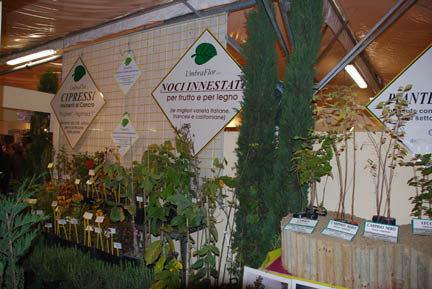 I think it was encouraging reforestation, but my Italian is very weak and I couldn't translate it. We didn't know about the fair that was in town, we had come to see Gubbio's other two claims to fame. 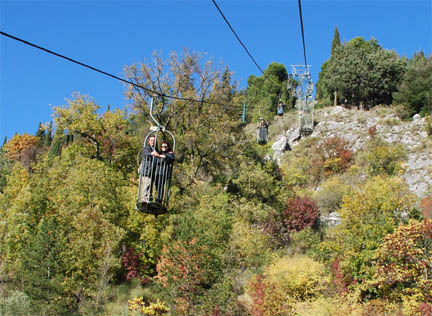 One is a cable car system that takes you 1200 feet up to the top of the hill. But it is not like any other one we've seen. The "cars" are small, two-person, open-topped, birdcage like contraptions. And the two people better be friendly because the floor is only about two foot by three foot in size. We rode it up and walked down the trail back to the town. 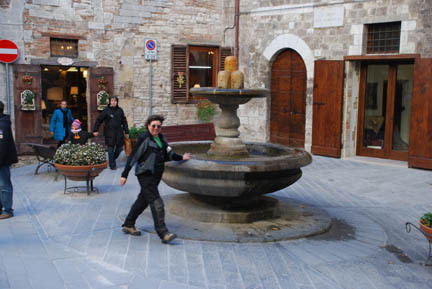 The other thing to do while in Gubbio is to run around this fountain three times. This make you an honorary "Madman of Gubbio". And we have the certificates to prove it, even if we can't read them. 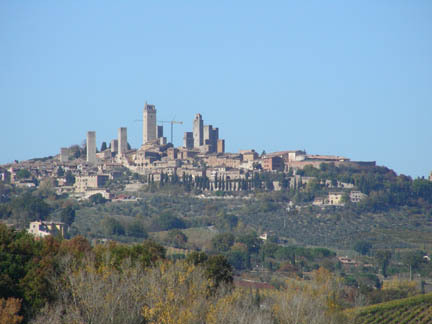 Next we crossed into Tuscany and went to the hill town of San Gimignano. This town is famous for its towers. The towers were built for defense originally but came to serve as a status symbol. "My tower is taller than your tower!" type of attitude. This went on for may years until the mayor at the time passed a law that no tower could be taller than his (at 51 meters or about 170 feet). That ended the competition. At one time there were many more towers but the hundreds of years since they were popular has caused many to come down. 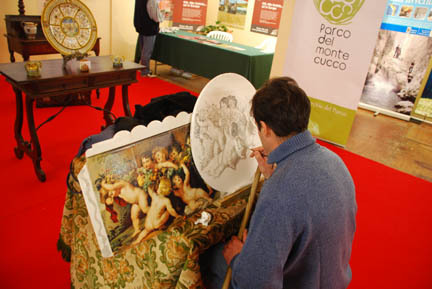 Then was Vinci, the home of Leonardo da Vinci, another hill town in Tuscany. No pictures were allowed inside the museum where there were models of many of his inventions including a parachute, rapid fire war cannon, water pumps and may more. There were also copies of some of his paintings (the originals are in bigger museums). 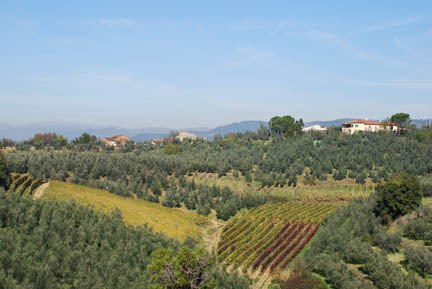 This picture is of the Tuscan hill country from the roof of the museum. 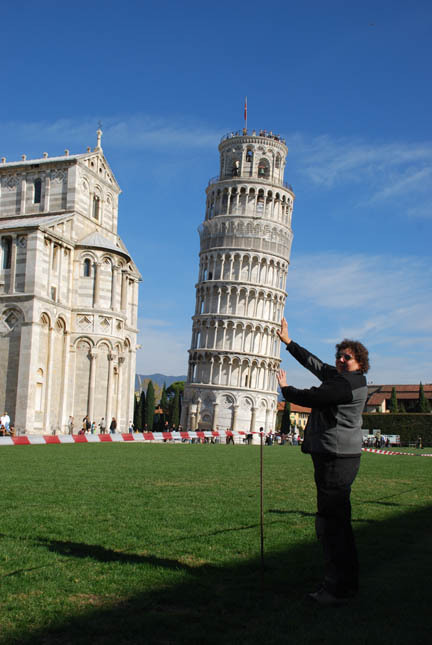 Next was Pisa, not a hill town, but still in Tuscany, where we took the obligatory picture. She wasn't strong enough to push it back upright so I had to help her, but then there was no one to take a picture, so we have no proof that we saved it from falling. We wanted to climb the tower but the next available timeslot was at 3:15 and it was then noon. We didn't want to wait because the nearest campground was in Florence, about 2 hours away. 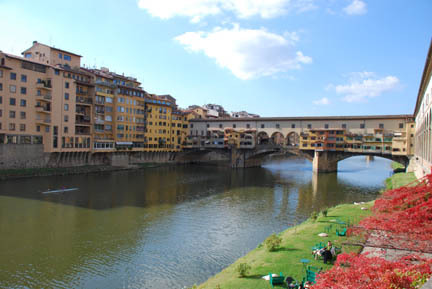 So we only spent a few hours in Pisa and went on to Florence. 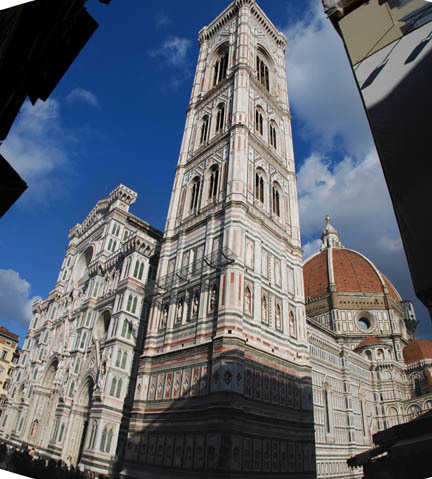 Florence has one of the most beautiful cathedrals in Italy, even including St. Peter's in Rome. It is made with white, pink and green marble in patterns. 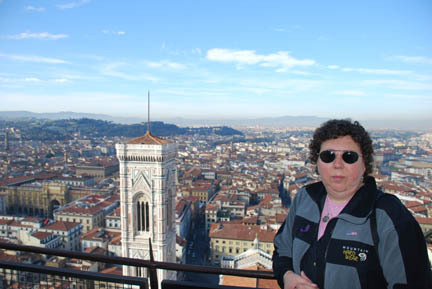 One can climb either the bell tower (foreground in the picture) or the dome (right background). We chose the dome. To get to the top you have to climb nearly 500 steps. First up a very narrow spiral stone staircase inside the wall to the base of the dome. You come out inside the church at the base of the dome and walk a narrow balcony half way round the dome to a doorway and another staircase. The balcony is along the lights at the bottom of the picture. One can almost reach up and touch the frescoes, except that they are about 10 feet off the floor. 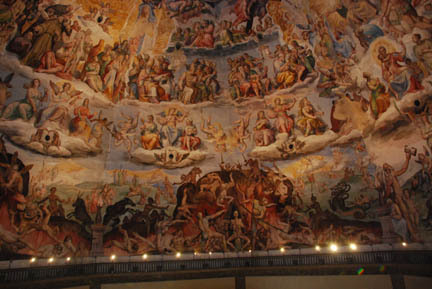 The human figures in the frescoes are 20-30 feet tall (the dome is huge). The frescoes are of Judgment Day when it is decided if one will go to Heaven or Hell and that one can get salvation from the church. Then the second staircase leads up between the two layers of stone that make up the dome to a trapdoor in the top where one can walk on a deck surrounding the cupola that is on the top of the dome. To return to the ground one takes the opposite staircase down in a mirror image of the one going up. 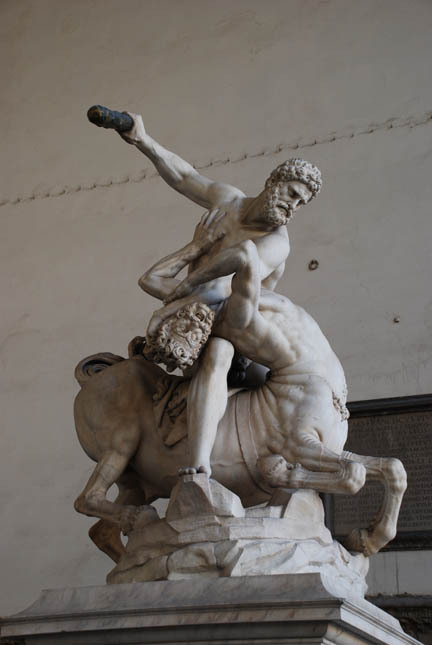 The Uffizi Gallery is the collected art works of several generations of the Medici family put on display in an old medieval office complex. Again no pictures are allowed inside. This was one of about a dozen oversized statues outside the museum. They had money and liked good art. Many of the best artists of the day, like Michelangelo and Botticelli, were commissioned to do works for them. It took several hours to view it all. We then took another rest day and sat in the sunshine and relaxed. We had both been fighting colds and needed it to help recover. It is now one week until our plane leaves and we must head north. the weather forecast is for sun south of the Alps and rain north of them. 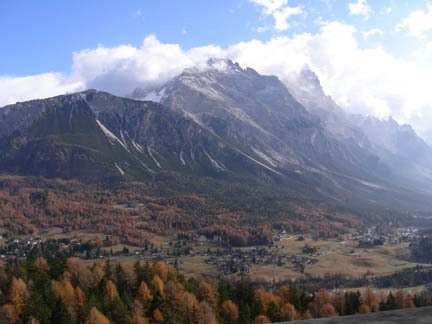 I decide that we can run a pass or two in the Dolomites and we head across northern Italy to the town of Belluno, north of Venice and at the base of the Dolomites. 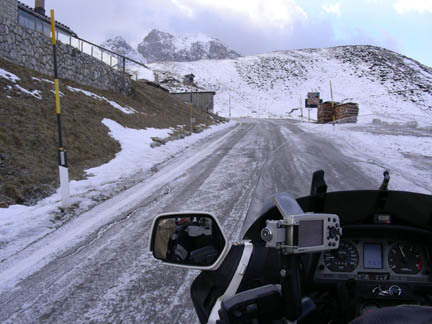 but soon gets cold and blowing dry snow covers the road as we get to the top of the pass. Going up is not as bad as going down. Slowing to enter a switchback is trickier than accelerating after completing it. 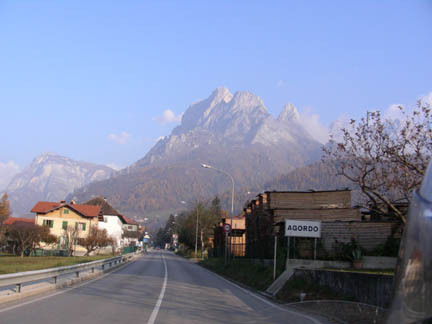 On the other side was another village surrounded by rocky topped mountains. We decided not to run any more passes and headed toward Munich. To get to Munich we have to follow this valley west to the Autobahn and go north over Brenner Pass to Innsbruck. At the top of the pass it was 27 F (-3 C) and snowing very lightly in a strong north wind. As we dropped into Innsbruck it started to snow heavier, but the temperature came up to freezing or even a degree or two above. North of Innsbruck is a range of hills about a thousand feet above the valley floor that Innsbruck sits on that we had to cross. By now it is snowing hard and sticking to the road but the wind speed has dropped a lot. Here it is about an inch (2.5 cm) of compacted snow and ice on the road. We still have a hundred kilometers to go. The temperature is just below freezing. Over the hills we slowly dropped in elevation and the snow turned to slush. I followed in the tracks of the traffic ahead of me, mostly on a narrow strip of bare and wet pavement for many kilometers. Conditions slowly improved and as we approached our destination the road was all bare and wet, the temperature at freezing and snow lightly falling. We saw two cars off the road in the ditch, one near where this picture was taken was oncoming traffic but had his rear wheels in our ditch and was sticking out into the lane blocking traffic. The other on the Autobahn near Munich was also oncoming but had traveled a couple of hundred feet in the ditch going up and down the roadside bank twice. They did not give me a good feeling for my chances of making it. But we did, only loosing traction once, but we recovered without incident. Now we are at our friends house near Munich and have five days to make it to Amsterdam, a long one day trip on the Autobahn. 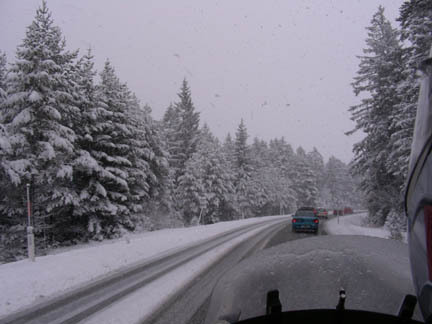 The trouble is that it is snowing hard today and all the roads are frozen. We'll check the weather report and plan accordingly. This will probably be uploaded before we know more. That is it for this year. We return in mid-March of 2008, if no more disasters happen!